I made this apple pie protein smoothie the other day and it was super simple and reminiscent of a sweet slice of apple pie with ice cream. Seemed like a good way to start the day to me! Running out of bananas is sometimes a good thing because it had me scouring the fridge in search of a replacement. I’m a huge fan of Trader Joe’s Big and Chunky Applesauce, it has one of the best consistencies mixing bigger chunks of sweet apple with regular applesauce and no added sugar! Then I decided to take the ‘apple pie’ theme all the way home and add a little pie spice in the form of pumpkin pie spice. While I don’t use a protein supplement everyday, I do like having one of my favorite options around when I’m going for super quick and filling smoothie. My 2 favorite brands are Sun Warrior and PlantFusion, they are both tasty options for a vegan or plant-based protein blend. Sun Warrior is a little gritty but honestly it’s a protein powder and it’s never bothered me. I also like PlantFusion and to date I’ve only tried their chocolate flavor, which quickly became a favorite. Either of these plant proteins are great for taking on vacation with a blender cup. Sun Warrior has only 84 calories per scoop and a nice 16g of protein boasting a complete amino acid profile. PlantFusion has 130 calories per scoop but clocks in at a whopping 21g protein per serving. Both carry the simplest and cleanest ingredient list you might ever see on a protein powder. No scary ‘Franken’ ingredients from either of these companies and they stay away from GMOs too. 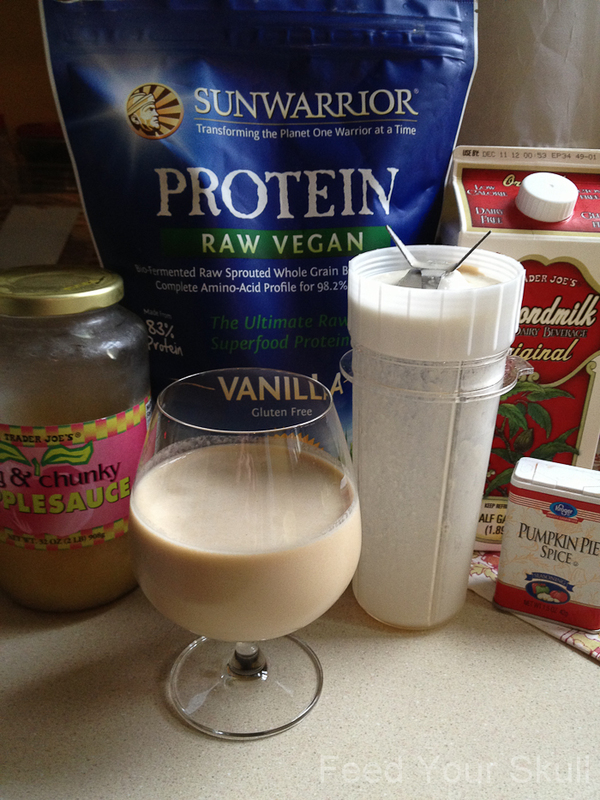 This smoothie will work great in the large personal blender cup like the tribest personal blender or the magic bullet. Thumbs up for easy grab and go smoothies! Add almond milk leaving about 2" to a large personal blender container. Add remaining ingredients and blend baby blend. What’s your favorite ‘out of bananas’ replacement for smoothies?